The Eucharist is exposed for Adoration in the Sacred Heart Chapel (West side of the Church) from Tuesday at 9:00 a.m. continuously until Thursday afternoon each week. 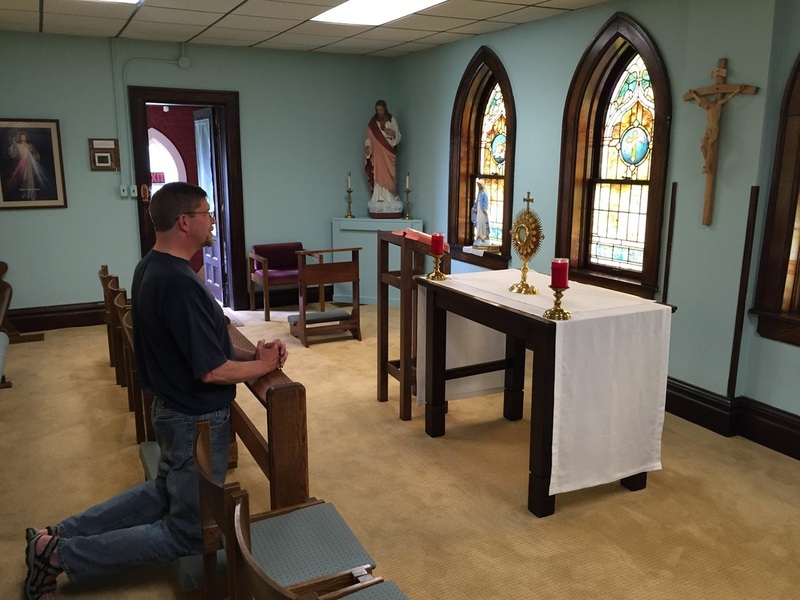 What is Eucharistic Adoration? Eucharistic Adoration is the practice of praying before the Blessed Sacrament exposed in a Monstrance. The practice has been part of our Catholic heritage from the earliest days of the Church. Here at St. Joachim Catholic Church we have a chapel – Sacred Heart Chapel – located on the west side of the church that we use for adoration. Parishioners are scheduled round the clock from 9:00 a.m. on Tuesday until 8:30 a.m. on Friday to be in our Lord’s presence in the Chapel. Why do we do it? As Catholics, we know that Jesus is truly present in the Eucharist. Jesus extends great blessings through his Body, and our relationship with him can grow immensely when we set aside time to adore him. Worship and prayer are extremely powerful in front of the Eucharist because it is truly Jesus, His Real Presence. Excerpts from the Adoration Prayer Journal: Below are some of the prayers that adorers from our parish family have written in the shared prayer journal in the Sacred Heart Chapel. Thank you, Lord for a wonderful hour. I very much enjoyed my time with you and am looking forward to spending even more time calling upon you in my difficult endeavors. Please give me the strength to make the best possible choices. Amen. Thank you, Lord, for the beautiful morning. Thank for you for the peace in rising. Bless our parish and our priest. Thank you for my time of adoration. Thank you, Lord, for this blessed time of prayer. I look forward to this time with you each week. Open my mind and heart to your words and your will. Thank you for your many blessings. Amen. Help us to be humble, Lord. Amen. We need your grace, Lord. Have mercy on us. Amen. Let love be our aim in all things – love of God and neighbor. And let a spirit of forgiveness reign in our hearts. I love my hour with you! The serenity I feel is true. Be at my side always. Please never leave me alone ‘till I can be with you in heaven, my future home. I pray! Amen. Dear Lord, I need some guidance. I need some help. I need some strength. I need you, my God. Thank you, Lord, for your grace and love that I feel here at adoration hours. Thank you, Lord, for giving me the opportunity and the willingness to be a perpetual adorer. I feel closer to you. I pray that more people will hear the call to adore you for one hour a week. Thank you for my life. I love you.